Review of a hand-made custom electro-mechanical pinball machine by Henk De Jager. Custom made jukebox and bimbo box. Review of a custom, hand-build pinball machine by Henk de Jager. Bally Nip-It pinball machine with clear plexi playfield..
Ben Heck created on a custom pinball machine with Bill Paxton as theme. Jeri is also working on her own custom pinball machine, 'As seen on TV'. How to build your own cabinet with Visual Pinball and Future Pinball software. Greg Freres started Whizbang Pinball together with Dennis Nordman. They now create custom pinball machines. Their first project is Whoa Nellie. An electro-mechanical custom pinball machine by Dominique John. Links to all other custom pinball machines there are. Henk de Jager created an electro-mechanical bingo machine. Older pinball game reviews moved here..
For some people having a regular pinball machine is not unique enough. Here are some modifications you can do to make the machine look better. Add leds to the mini-saucers on your Attack from Mars pinball machine. 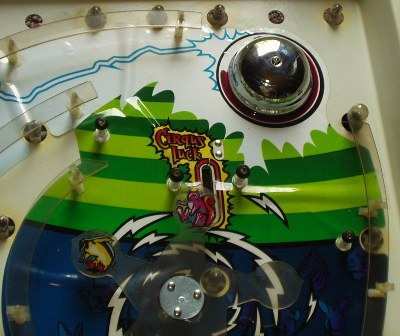 Install a real bell in your Cirqus Voltaire pinball machine. How to install a multicolor led near the Palantir ball. Light up the skillshot ramp on Theatre of Magic. Light up the Battlefield mini playfield on Ballys The Shadow. Light the racetrack on Indy 500. Add a third saucer to your RFM pinball machine. Light the telephone dial better on Ballys Who Dunnit?. Light up the right side of TAFs playfield. Most Hurricanes didn't have lamps in their popbumpers installed. Detailed instructions how to add them yourself. Add leds to your The Shadow and Medieval Madness pinball machine. Cactus Canyon doesn't have a real knocker coil installed. It's not difficult to add it yourself. Read how I reproduced 3D plastic parts for my Cactus Canyon pinball machine myself. New Stern pinball machines have pinled displays installed. You can retrofit a real plasma display. DMD Extender is a kit that allows you to display the dmd animations on an lcd screen. Either run is separate from the machine or as a replacement for your dmd. Here it's installed in a Sega Baywatch.